『퇴우이선생진적(退尤李先生眞蹟)』은 조선시대의 서화가들인 이황(1501∼1570), 송시열(1607∼1689), 정선(1676∼1759), 정선의 아들 정만수, 이병연(1671∼11751), 임헌회(1811∼1876), 김용진(1883∼1968) 등의 글과 그림을 한데 모아 연대순으로 묶어낸 서화첩이다. 모두 8엽으로 되어 있는데 내용의 순서를 보면 제1엽은 퇴우이선생진적이라는 그림과 표지글이 있고, 그 뒷면과 제2엽 앞면에 정선의 계상정거도(溪上靜居圖)가 그려져 있다. 제2엽 뒷면에서 제4엽 앞면에는 이황의『회암서절요서(晦菴書節要序)』가 쓰여있다. 제4엽 뒷면과 제5엽 앞면에는 송시열의 글이 있다. 제5엽 뒷면, 제6엽 앞뒷면에는 정선의 그림인 무봉산중(舞鳳山中), 풍계유택(楓溪遺宅), 인곡정사(仁谷精舍) 등이 그려져 있다. 제7엽 앞면에는 이병연의 칠언절구 시와 년기, 서명, 낙관 등이 있고 제8엽 앞면에는 임헌회의 글과 김용진의 글 등이 있다. 이 서화첩의 속종이는 닥나무종이이며, 겉종이는 두터운 종이로 만들어 상태는 좋은 편이다. 모두 명문장과 명화여서 학자들의 인격과 서화가들의 예술세계를 엿볼 수 있다. 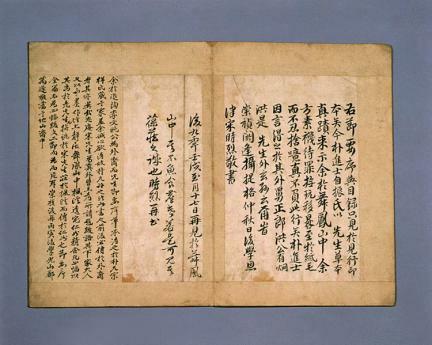 This is a chronologically compiled manuscript of literary works and paintings of Yi Hwang (pen-name: Toegye, 1501∼1570), Song Si-yeol (pen-name: Uam, 1607-1689), Jeong Seon (pen-name: Gyeomjae, 1676-1759), Jeong Man-su (son of Jeong Seon), Yi Byeong-yeon (pen-name: Sacheon, 1671-1751), Im Heon-hoe (pen-name: Gosan, 1811-1876), and Kim Yong-jin (1883-1968). The eight-sheet album is composed as follows: the front side of Sheet 1 contains a picture and the subject; Jeong Seon-drawn painting titled Gyesajeonggeodo (picture of a fowl pen) on the back side of Sheet 1 and the front side of Sheet 2; Yi Hwang-compiled Hoeamseojeolyoseo (Summary of a Collection of Zhu Xi’s Writings) on the back side of Sheet 2 through the front side of Sheet 4; works written by Song Si-yeol on the backside of Sheet 4 and the front side of Sheet 5; Jeong Seon-drawn paintings titled Mubongsanjung (picture of his grandfather-in-law Bak Ja-jin and Song Si-yeol), Punggyeyutaek (picture of his grandfather’s house), and Ingokjeongsa (picture of his house at the foot of Inwangsan Mountain) on the backside of Sheet 5 and the front side of Sheet 6; Yi Byeong-eon’s poem, signature, and seal on the front side of Sheet 7, and; works written by Im Heon-hoe and Kim Yong-jin on the front side of Sheet 8. Mulberry paper was used for the album, which has been preserved well. These painters and the men of letters are all those representing their respective eras of the Joseon Period (1392-1910).